Last April, I was invited to perform at an artists' reception for New Creation Arts Group, the student arts group at Duke Divinity School that I didn't even know existed at the time (I was not very plugged in at all last year). By mid-May, I was one of two co-leaders for the group. I didn't know what I was supposed to be doing, but I had caught wind of something that fascinated me: the power of theology through the arts to educate, transform, worship and more. Despite having been embedded in the arts all my life, I had thought little about theology and the arts formally except in a historical context--I took an art history course on Gothic Cathedrals, an icon theology class, a few literature and writing courses that had to do with religion or spirituality, etc. Suddenly I was very interested in how the arts can and should be a part of the local church here and now. Having been thrown into leadership in an area that was still new to me, I looked around for something to read. For the Beauty of the Church immediately jumped out at me. The editor, David Taylor, is a Th.D. student at Duke; Jeremy Begbie, one of the contributors, is the faculty adviser for New Creation and is at the forefront of theology and the arts; and there were a few other familiar names among the authors of this collection of essays. The book emerged from a symposium called "Transforming Culture" and includes essays that provide insights on the arts in the church from various viewpoints: the artist, the pastor, arts in worship, the art patron, etc. In this book, art is explored as a gift, a calling, a vehicle of worship and relationship-building, a pedagogical tool, and even a danger--the writers do not hesitate to warn the reader of the ways in which the art or artist can be abused or even elevated above the Gospel. Then, too, one writer warns against incorporating only the liturgical arts into the life of the church--this, Joshua Banner writes, creates a false dualism between what happens Sunday morning and what goes on the rest of the week. This was important for me to hear, because I am obsessed with worship and am more than ready to use music, dance, painting and more in that setting, but I need to be reminded of the myriad of ways in which the arts intersect with our lives outside that setting. 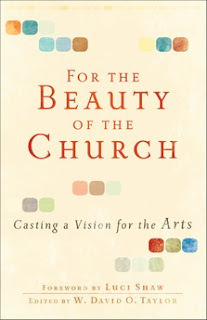 This post would get far too long-winded if I tried to summarize each of the essays, so I'll leave you with some favorite quotations and a strong recommendation to pick up this book if the idea of arts in the church inspires you--or, perhaps even more so, if it perplexes you.